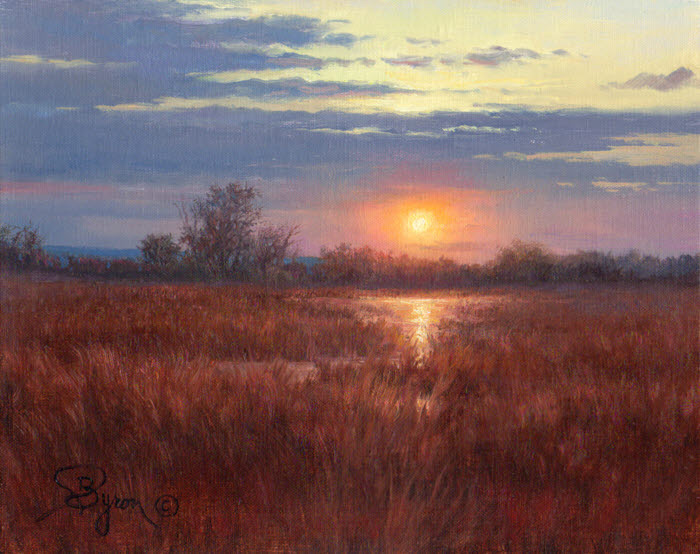 Hagerman Art Blog by Artist William "Byron" Hagerman | Realism | Impressionism | Landscape Oil Paintings | Two Styles, Two Signatures, One Artist! 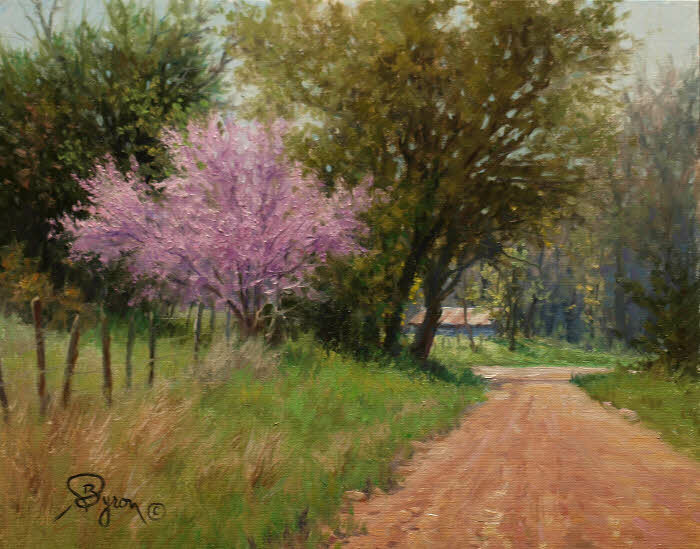 Realism | Impressionism | Landscape Oil Paintings | Two Styles, Two Signatures, One Artist! 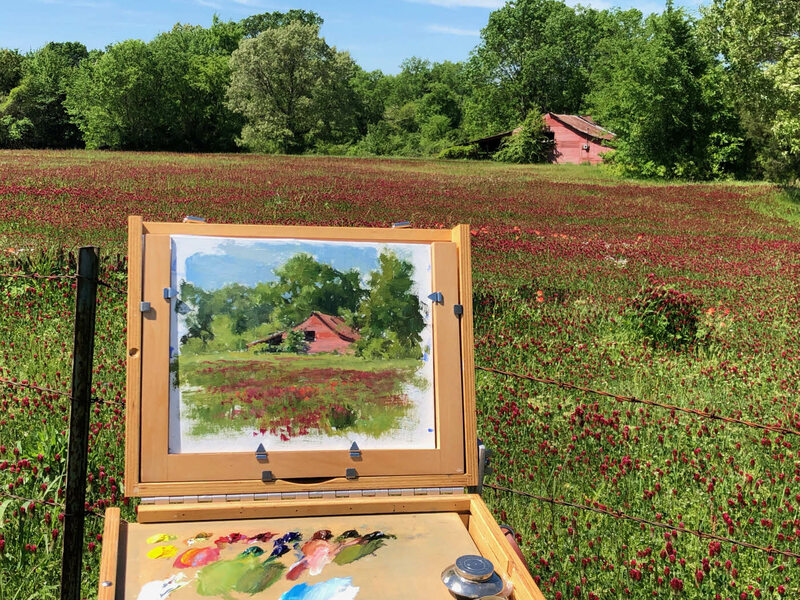 I was recently able to experience the plein air painting benefits when coming upon an old red barn in a field full of red clover flowers. It simply could not be passed up. Below you can see my pochade box for plein air (out of doors) painting and my subject matter behind. This painting with its easy title (Red Barn and Red Clover) will also be up for auction on eBay starting April 21st, 6pm Pacific Time along with two other paintings shown below. It’ll end April 28th. You can access the auction from my profile page. So what are the benefits of painting out of doors, versus working from a photo? Simply put, photos lie compared to what your own eyes can see. Camera’s are a distortion of reality. Although I find it essential in recording details and the fact it’s not always possible or practical to paint at some locations. However, painting from life increases your understanding of color, light and values more so than anything else. You also become aware of a camera’s limitations and how to work work with those limitations. But, what if you don’t have the desire or it’s not practical to paint on location? Try taking just your paints, and mixing the colors you see and make notes in a journal. Sort of a color chart. Of course take a photo to remind you of your scene or do a pencil sketch… or both. So get out and give it a try! It’ll lend authenticity to your work. 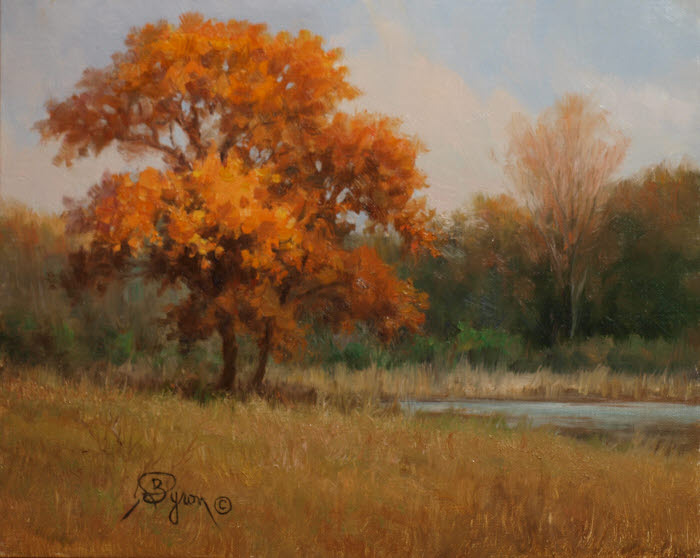 If you need plein air painting supplies, here’s a link to Judson’s Art Outfitters. I purchased the 9×12 Guerilla Box years ago and it’s still going strong. Now living in North East Texas, it’s been enjoyable to see a variety of trees and flowers not previously encountered. In several areas there were flowering Dogwood and wisteria growing up along fences and even up into the trees. Not to mention fields and fields of yellow flowers. So I decided to combine all three. Hope you enjoy these latest 3 Byron paintings! 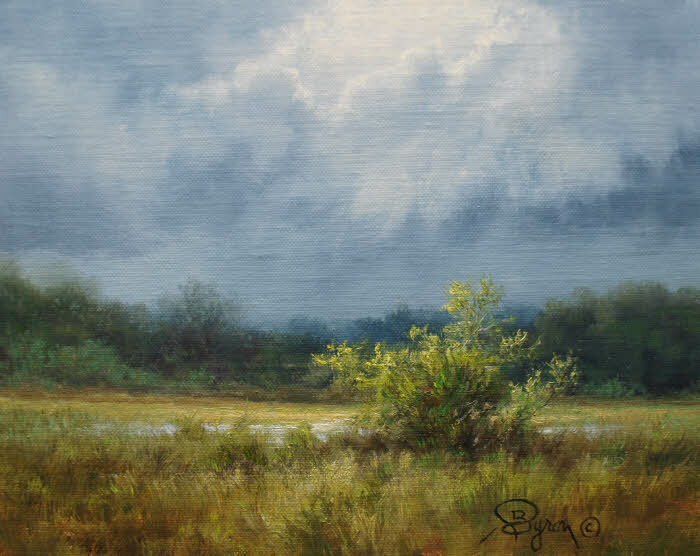 This entry was posted in Art Tips, eBay Auction Paintings and tagged art tips, eBay paintings on April 21, 2019 by William. Well, Spring is definitely here in North East Texas. My allergies can attest to that. 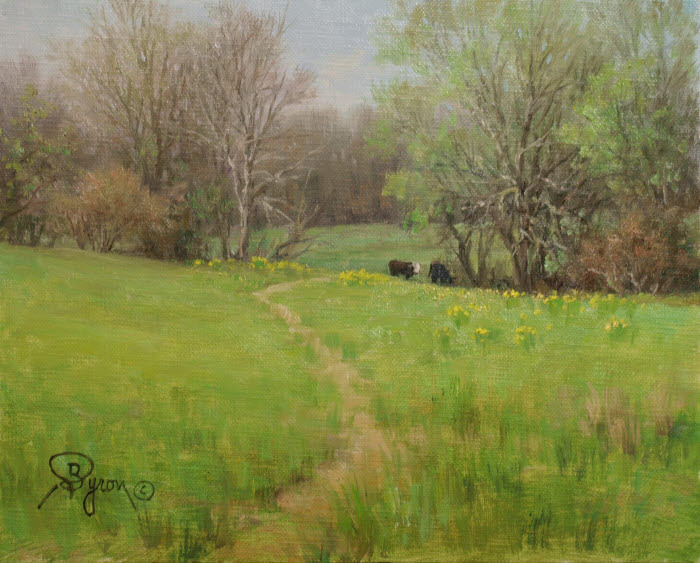 But, the season has also inspired three new springtime eBay oil paintings all based on actual locations. This current auction will end Sunday April 7th starting at 6pm Pacific or 8pm Central Time. You can click the link below the painting to go directly to the auction. Starting bid is only $49. It’s a great price for an original painting on linen panel and the small size means they can just about fit anywhere and in any decor! While riding as a passenger I saw a glimpse of a red bud tree in bloom. There was no disappointment upon returning to further investigate the scene. Although the asphalt pavement was converted to a dirt road. Thanks to zoom camera lenses I was able to capture this distant view of a graceful tree with new leaves. I found it to be a restful and relaxing scene. Some of the county roads in this new wonderful area I get to explore are definitely rewarding with subject matter. This old barn was almost not even noticed as there was another larger barn closer in view. However, this one was already situated in a natural artistic composition. 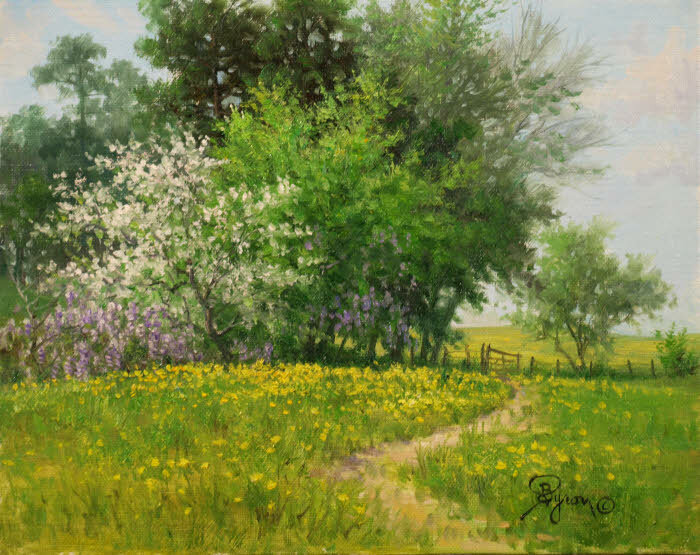 I hope you enjoy these new Springtime eBay oil paintings. 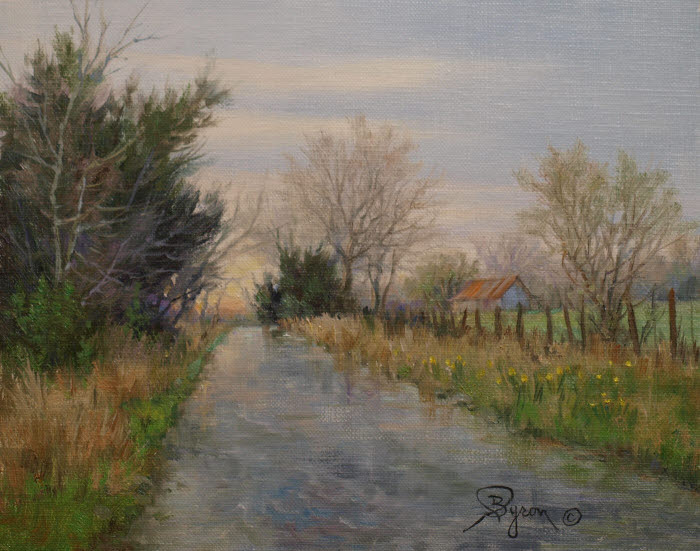 The painting “Off the Beaten Path” will soon be an oil painting tutorial here on the blog so you can see the order in which it was painted. Until then. Thanks! This entry was posted in eBay Auction Paintings, Impressionist paintings, Small Paintings and tagged eBay paintings on April 3, 2019 by William. After 36 years living in West Texas, we undertook a big change in moving to North East Texas settling in a small community about 100 miles north east of Dallas. My what a change this has been. However, for an artist, it’s such a beautiful area that has plenty of subject matter. Now I have plenty of new inspiration for my art work. 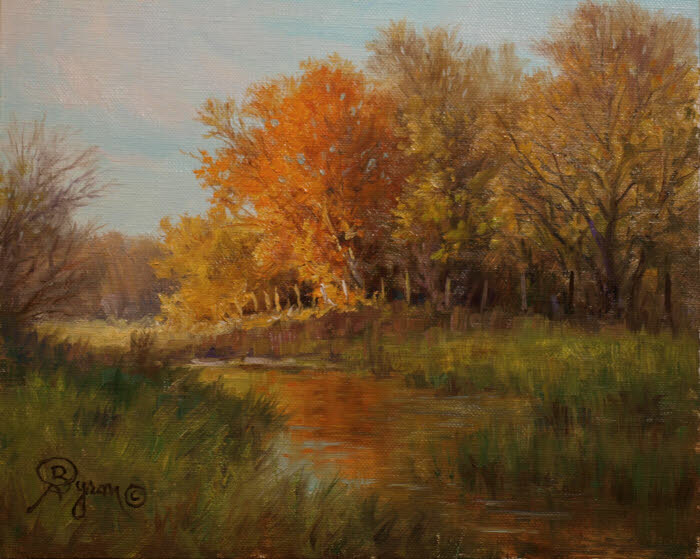 So after an absence for a time, I’m back to doing some painting and wanted to share my latest eBay auction featuring six of my Byron Signature works of some north east Texas Landscape Oil Paintings. Here they are: Click on a title to go directly to the auction. Bidding Starts at $49. However, there’s one among the group that starts at only a penny! 🙂 The auction ends Sunday March 3rd between 6pm and 6:30 pm Pacific Time and 8pm 8:30pm central. I appreciate you taking a look. Hope you win a painting! If you would like to stay informed about my art, please subscribe to my newsletter. This entry was posted in Uncategorized and tagged ebay auction on February 25, 2019 by William. The auction ends Sunday June 3, 2018 at 6pm Pacific Time. So hurry there’s just a few minutes left before the sun goes down on this auction. Bidding started at only a penny! Click here to go straight to the auction. Happy bidding and hope you win! This entry was posted in eBay Auction Paintings and tagged eBay paintings, impressionist painting on June 1, 2018 by William. Learning how to improve your paintings, often boils down to experience in learning to self critique your work as you work. To have the right mind-set, think of your painting as a journey in which you want to lead your viewer through your painting without tripping along the path. In other words remove obstacles that could lead in the wrong direction or cause them to stop and stumble. The following painting demonstration will show you some of my thought processes on how changes were made along the way to remove obstacles. This was a commissioned oil painting for a 24×36 bluebonnet with Indian Paintbrush flowers. First up is the completed scene of “Interwoven Harmonies,” for reference. The painting’s journey begins as usual with a composition sketch using thinned ultramarine blue paint and a brush. Color is then applied starting with the darker cedar tree for comparison of adjacent areas. My goal before too many details is to cover the canvas as seen in the next photo. 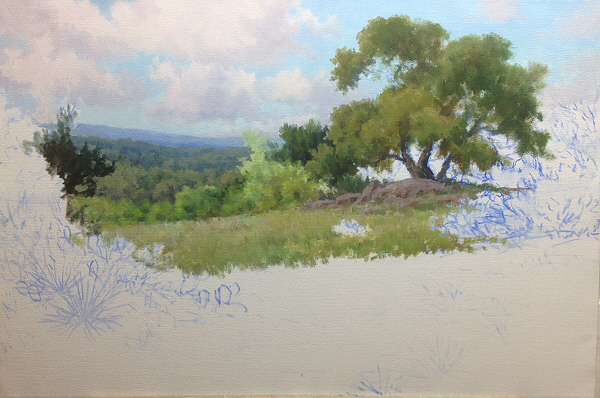 Now that the canvas was covered I began adding details to the distant hills. First adjustment was to remove the dark cedar next to the oak tree as my eye went straight to it and it wasn’t a very important element. Next more interest was added to the sky. Further analysis: Space division in the distant hills were too similar and uninteresting, so here the hills were modified. 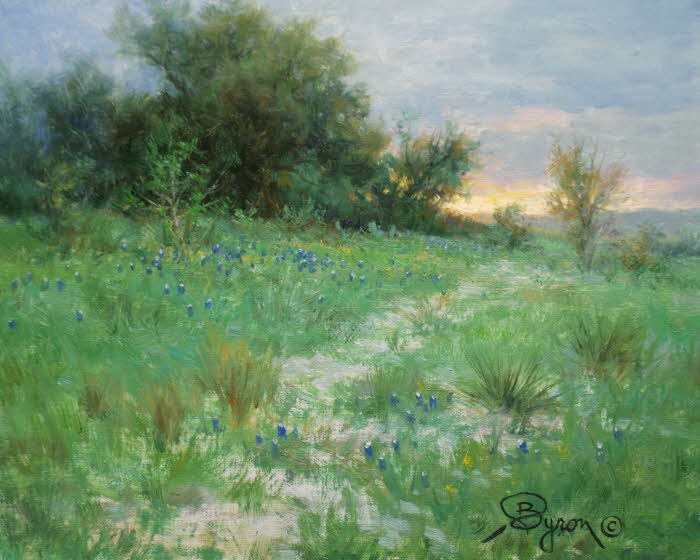 The green grass (paint) has dried and now the pattern of bluebonnets and red Indian Paintbrush can begin. More flowers are added along with a relocation of the rock patch. More details and more flowers. 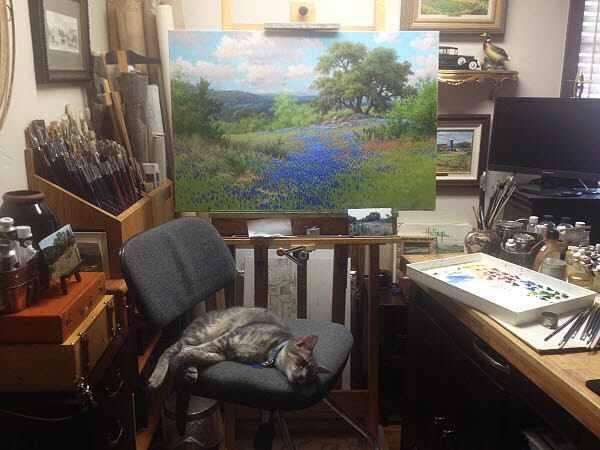 Our cat Hachi, the day before this photo jumped onto my palette and got ultramarine blue and umber on his paws. 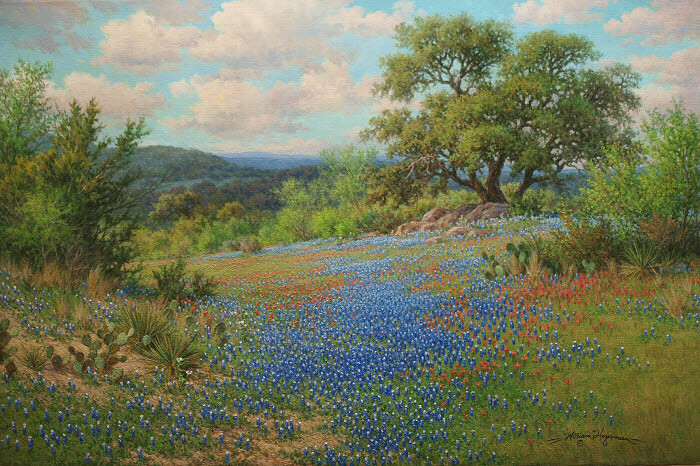 I told him if he wanted to paint to make himself useful and add in some more bluebonnets for me. I think he’s got some talent. He removed the patchy dirt and took out the yucca type plants on the right. Then he added a patch of dirt around the other cluster of yucca on the left. That was a good idea. However, at this point he told me he no longer wanted to be an artist. 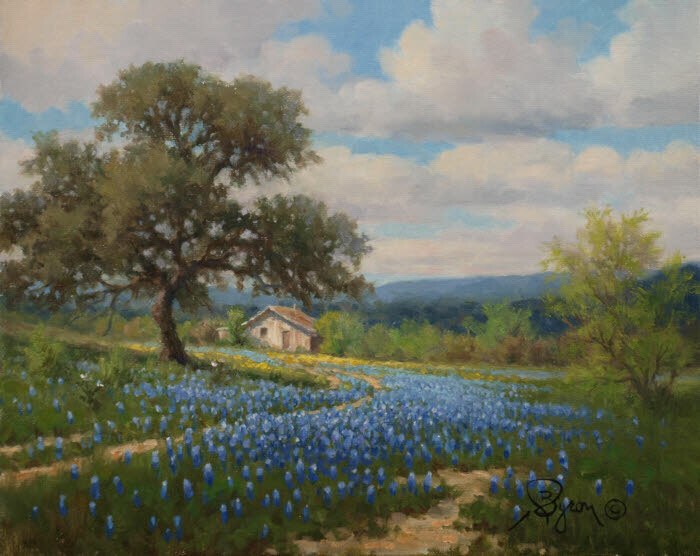 Painting bluebonnets was just too much work. Despite Hachi’s talent he still didn’t address other weak areas. So here I’ve highlighted those stumbling blocks to a viewers journey in the painting. Here you will see how some of the issues above were handled. Then I encountered another strange visual of an unintended tangent line that was noticeable from a distance in the bluebonnet patch. Once again here’s the final painting for comparison. 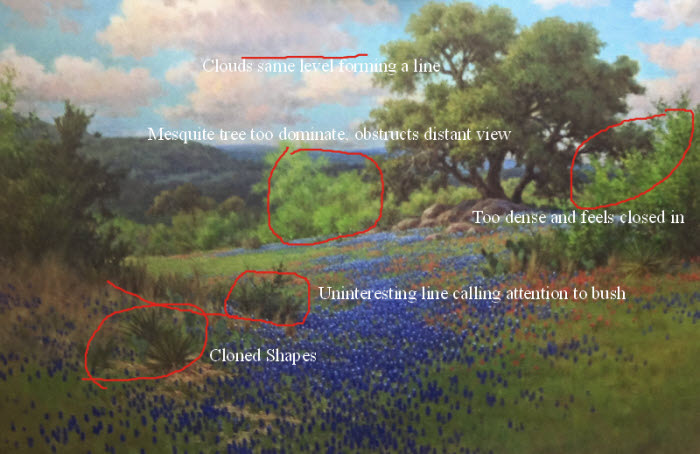 You’ll notice that another cloud was added to break the visual line of clouds as well as fixing the tangent line in the bluebonnet patch. Other tweaks were added here and there. Painting is about making choices. The end result is you want your viewer to go on the journey through your painting as you intend without tripping them up. Remember, that even if something is there in a reference, you don’t have to put it in. You can add and subtract elements, redesign them to enhance the visual impact of your work. I hope my “self critique” has illustrated that little improvements can make for a bigger visual impact and pleasant journey for your viewers. 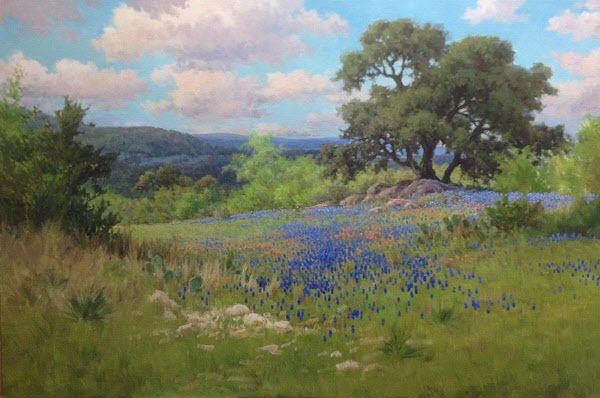 This entry was posted in Art Instruction, Art Tips and tagged art tips, oil painting demo on May 21, 2018 by William. If I painted from other people’s reference photos, is my work considered original? If I’m working with my own reference photos, do you care if they were taken in a photo workshop? So what makes artwork original? My reply, although not intended to be legal advice on copyright issues, perhaps will give food for thought. Most artists use reference material, even having files of clippings from magazines and other sources. These include, electronic images, paper as well as their own photos, sketches etc. Artists use these as tools for inspiration and designing their art. Part of the issue is the extent to which a reference is used (originality) when it comes from someone else (copyright issues) and whether you have the right to use the images. The first issue is when painting from other peoples reference photos. A photo like art is protected by copyright. If you’ve been given the OK to use them without restriction, then of course you can use them. If you’ve copied the photo verbatim, in a painting, the originality would be questioned. After all it was still another persons vision. But, if you’ve only used it as a reference to incorporate into your own composition then you’re using your artistic talents to compose a scene and not someone else. Thus, it’s an original. If you take your own reference photos even in a workshop setting, YOU still took those photos, so you have the right to use them unless there was some restrictions as part of the workshop on their use outside of the workshop, but other than that they’re still original. However, there can be exceptions, but not in regards to originality. If you’re painting from a human model and you paint them in such a way that they would be recognizable. There could be the question of having a model release giving you the right to use that persons image. I was in a workshop that had a cowboy model and I took my own photos. If I painted him in the future in such a way as to make him identifiable, I might wonder whether or not another model release was needed. There was an art show in connection with this workshop and the painting of him that I did sold. So there may have already been a general model release as part of the workshop. In my opinion if you have the right to use a reference photo taken by someone else, but have copied it as is, then I would question originality even if you had the legal right to use the photo. It was another persons vision. If you’ve taken the photos then that’s you’re vision. Just as along as you’re not infringing upon another persons rights or trademarked images. I hope this gives some clarity. This entry was posted in Art Topics and tagged art tips on May 11, 2018 by William. Busy, is a word that comes to mind when thinking about how much time has passed since the last blog post and how quickly time flies as the saying goes. But, I have a couple of things to share. First is some exciting news. 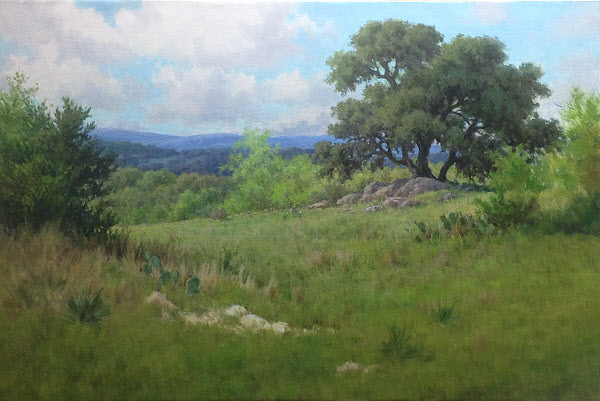 A while back I was contacted by the President of Somerset House Publishing who was looking for an artist to fill their need for Texas landscape images. Apparently my work fit the bill, so a contract with Somerset House Publishing was recently signed for the reproduction of several of my best Texas artwork images in open edition. 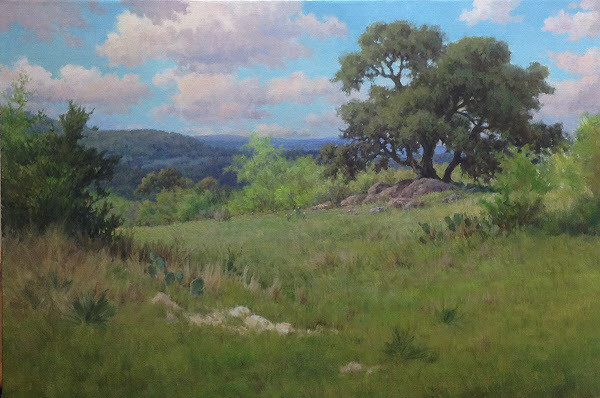 Somerset has been the publishers of works by artists such as: Larry Dyke, G. Harvey, Martin Grelle and many other fine artists. So it’s nice to be included with such a line up. Four images of previous work are currently available for purchase with more to come. Please check out my page on their website. 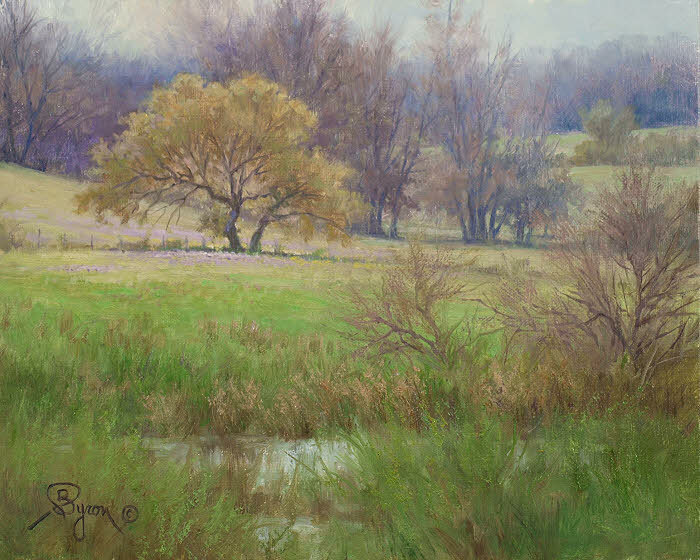 The American Plains Artists or APA is a Non Profit artists organization that highlights the American Plains region as a source of artistic inspiration and has an annual national juried show. About 16 years ago, I built their first website and in comparing it to todays standards the website looked like it was built 16 years ago! So starting in late October 2017 the first phase of rebuilding the website from the ground up began. I was pleased they wished to keep the backdrop image (although cropped) on the home page which in their eyes depicted the plains nicely. It was a painting of mine titled Red Erosions and was an actual view here in West Texas. The project certainly was challenging, but it offerend a different aspect to creativity including developing an instructional video and one that highlighted the Plains region and the activities of the APA. Please take a look at their new website and my “other” creative endeavor including the video found on their education page. Now it’s time to get back to my own artwork. Stay tuned and thanks for reading! This entry was posted in Annoucements, Art Topics and tagged announcements on January 29, 2018 by William. Is it Two Cool or Two Warm? Will it be two cool or two warm? You get to decide in my latest eBay auction oil paintings. The auction ends Sunday evening October 29th. To try your hand at bidding one of these works, you can access the auction through my profile page or click the Title links for each painting below. Starting bid will be $49 for all, except for one which will only be a penny to keep it interesting! Hope you’ll join in on the auction. 🙂 Each are painted on linen panel. You can click the images for a larger view. So what are warm and cool paintings? Some may wonder about the terminology of warm and cool, whether it be specific colors or an entire painting described in either term. When it comes to colors, we tend to associate blue and green tones as being cool in comparison to warmer colors such as yellow, orange or red. Sort of like comparing fire and ice. A paintings overall color temperature can be classified as either warm or cool depending on what colors predominate the scene. 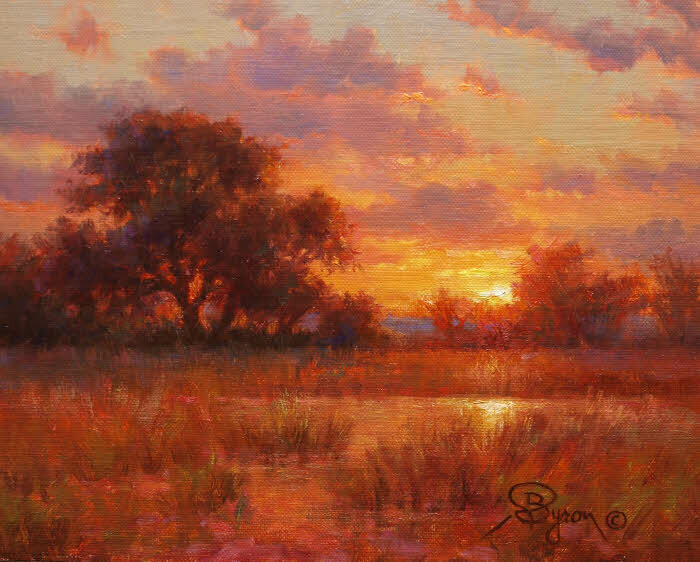 Color harmony can be lost if a painting has an equal distirubtion of warm and cool tones that compete with one another instead of lending support. The paintings above illustrate the idea behind a paintings overall color temperature. So, will it be two cool or two warm? Happy bidding! This entry was posted in eBay Auction Paintings, Impressionist paintings, Uncategorized and tagged eBay paintings on October 20, 2017 by William. 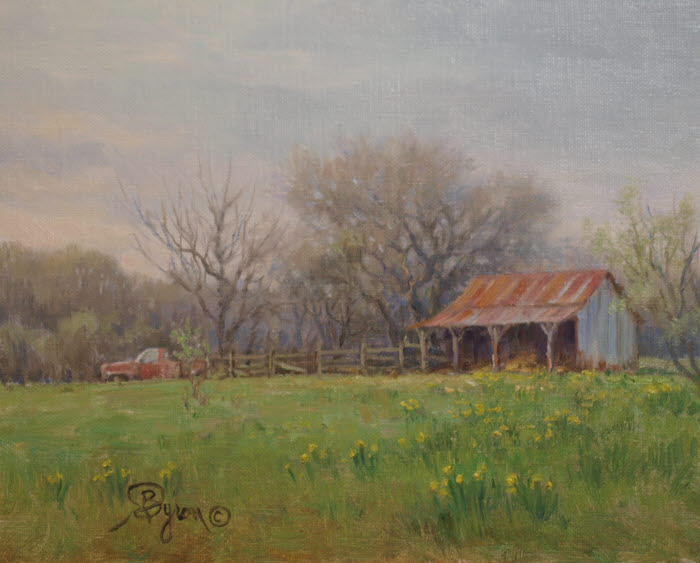 In this series of three 8×10 landscape oil paintings with old barns is currently offered via eBay auction. You can click the image to go straight to the auction. Bids begin at only $49 for these gems. Each are painted on a linen panel! 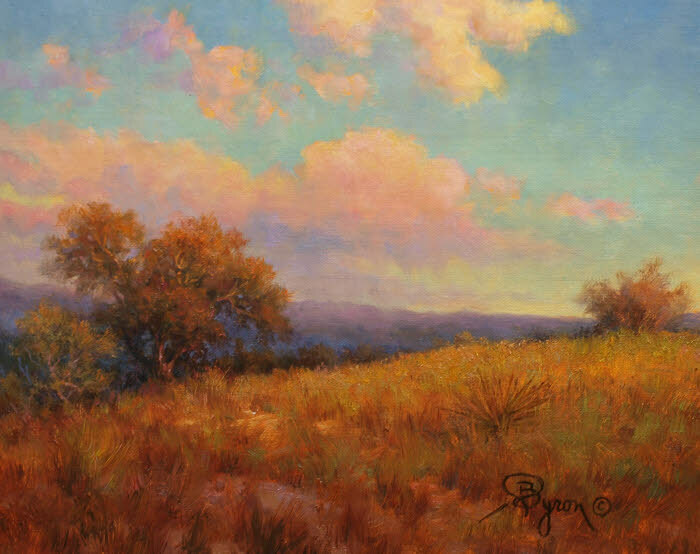 This New Mexico inspired scene is also showcased in my short oil painting video lesson. 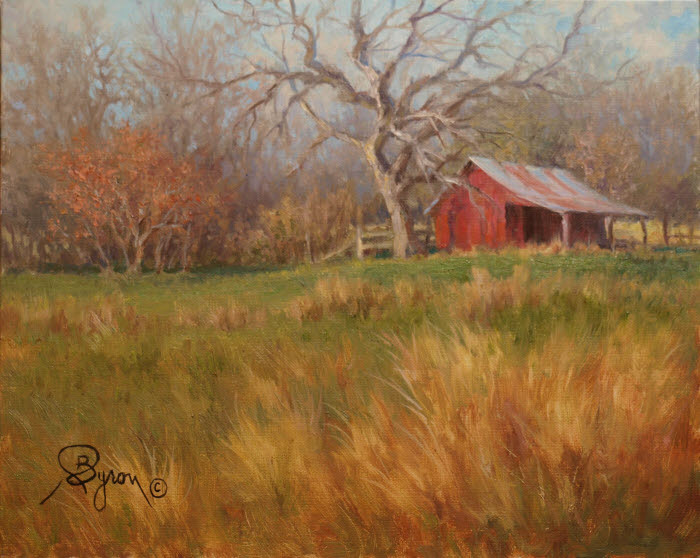 Next is an old red barn found near Winnsboro, TX. And finally in this series a landscape that was originally inspired from a trip to Montana. Hurry the auction ends Sunday, October 1st, at 8pm central time. Ending times are staggered by 7 minutes for each. Thanks so much and happy bidding! This entry was posted in eBay Auction Paintings, Impressionist paintings and tagged eBay paintings on September 28, 2017 by William. 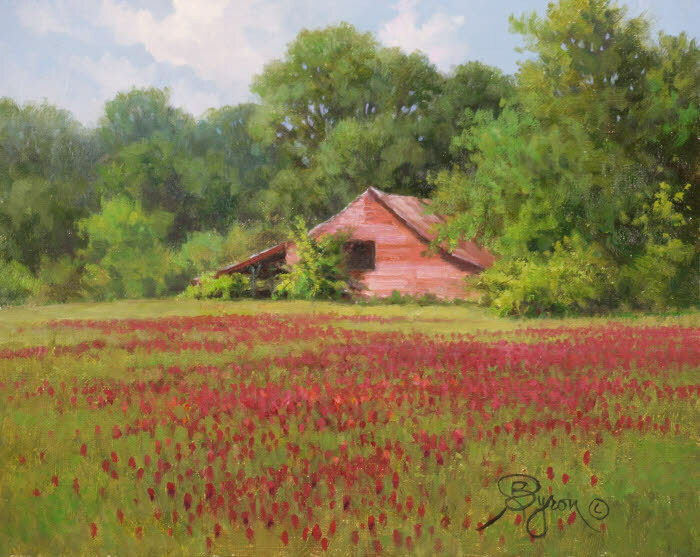 In this post I wanted to share with you a short two-minute Oil Painting Video Demo: Old Barns. 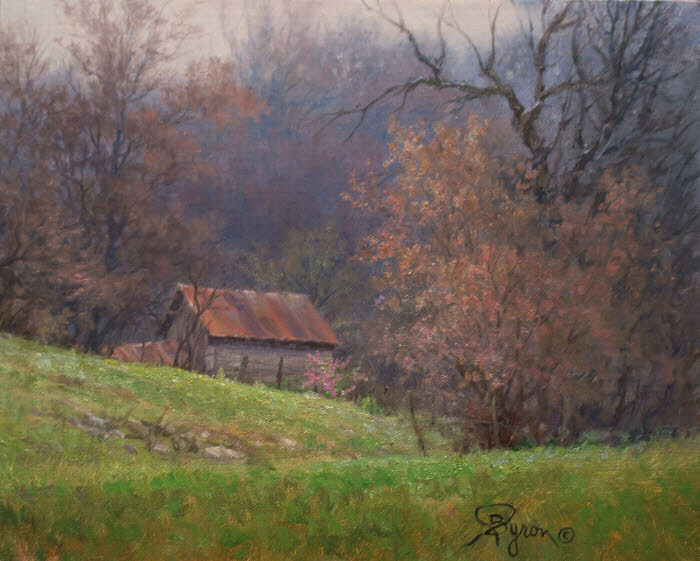 In this tutorial, the subject of old tin barns, which were found in New Mexico made a nice subject for this painting demonstration. 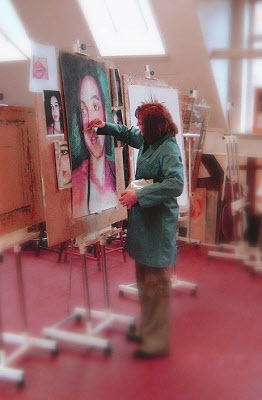 The direct method or alla prima approach was used in which the entire painting was completed in one session. This entry was posted in Art Instruction, Video and tagged oil painting demo on September 28, 2017 by William. Creating happiness through visual art in two styles: Realism and Impressionism. 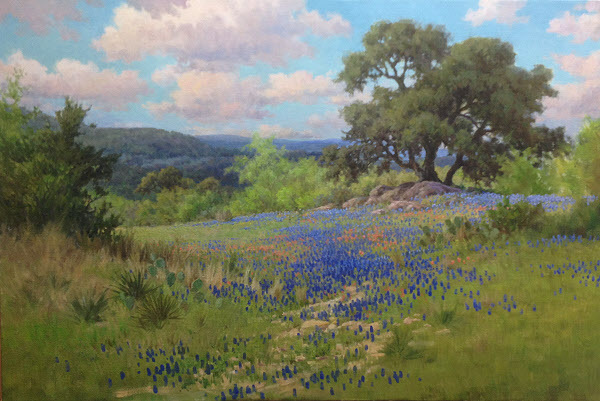 Spring Consonance 24x36 oil copyright 2017 by William Hagerman $5500.00 Available at Folger Gallery Midland, Texas. Click Image to learn more! Just a reminder, before you leave, please let me know you visited by commenting or opting in on my easy sign up form to receive updates if you haven’t already. I don’t share your email if you sign up, but I do like to share my art and thoughts on painting with you.